Welcome to Patriot Lacrosse Youth Club. Patriot Lacrosse Girls promotes the development of the “fastest game on two feet” by Honoring the Game by respecting the ROOTS: Rules, Officials, Opponents, Teammates and Self. Practices will begin early to mid-March, weather depending. Practice dates and times will be determined by each teams coach. Teams will participate in a playdate on Sunday, March 17th, 2019 with the other teams in Colorado Springs. Games will begin the weekend after Spring Break and run through May. Games will be played on Saturdays at outdoor fields across Colorado which may include travel to Denver or Pueblo. Our home games will be played on the turf field at Rampart High School. The regular season will end with the Festival Tournament. The teams will have the option to play in Rocky Mountain Jamboree tournament, June 8 – 9th, 2019. Patriot Lacrosse is opening registration to form teams for the Colorado Girls Lacrosse Association (CGLA) spring season. CGLA will form divisions of play based on the following age groupings: U9, U10, U11, U12, U13, U14 and U15. The following divisions will apply at each age groups U12, U13, U14, and U15: Silver for beginning players and Gold for advanced players. U11 and younger will only play smaller field size, 7v7 games. CGLA is adopting this based upon US Lacrosse recommendations to develop players on age appropriate field size. CGLA’s rules for play are primarily based on the 2019 US Lacrosse Rules for Girls Youth Lacrosse can be found here. The Patriot Lacrosse Club mission is to teach youth athletes the life lessons of skills development, teamwork, safe play, and sportsmanship in both a recreational/developmental environment and a competitive environment that prepares these young athletes for high school level competition. With that said, Patriot Lacrosse strives to form a competitive (Gold) team and a beginner (Silver) team in each division. Due to the size of the Patriot Lacrosse Club membership, it is impossible to form 2 teams (competitive and beginner) in each of the CGLA age division. Therefore, Patriot Lacrosse will register teams in the divisions that best suits the teams. Following CGLA/US Lacrosse recommendations, Patriot Lacrosse team sizes will be capped at 22. Competitive teams will be capped at 18. When the registration numbers in a division hit 43 players, all additional players will be “wait-listed” until a minimum of 13 players are registered. Wait-listed players not added to a team will be given a refund on their registration fee. If possible, Patriot Lacrosse will coordinate with another Colorado Springs Girls Lacrosse Club to combine wait-listed players into a combined club team. Team/level expectations of play can be found on the Patriot Lacrosse website under the Club Policies tab on the left side of the home page, click here to view it now. NOTE1: All athletes must have a valid US Lacrosse membership. NOTE2: Uniforms are required at an additional cost. NOTE3: Registration is not complete unless a payment is made. NOTE4: Patriot Lacrosse Club reserves the right, in its sole discretion, and with or without notice, to limit or terminate the rights and/or membership of members who are not an asset to the organization or in good standing with Patriot Lacrosse Club, CYLA, CGLA, and the US Lacrosse Code of Conduct. All players are required to have a US Lacrosse membership that is active through the end of the season. US Lacrosse membership provides Patriot Lacrosse Club with liability insurance and individual players Excess Accident Medical coverage. Registrants can join and check the status of their US Lacrosse membership by clicking here. A complete spring uniform is required to participate with Patriot Lacrosse. A complete uniform consists of a reversible game jersey, game shorts, and a shooter shirt. All players must have a complete uniform for the 2019 season. The uniform consist of three pieces, shorts, shooter shirt and jersey. 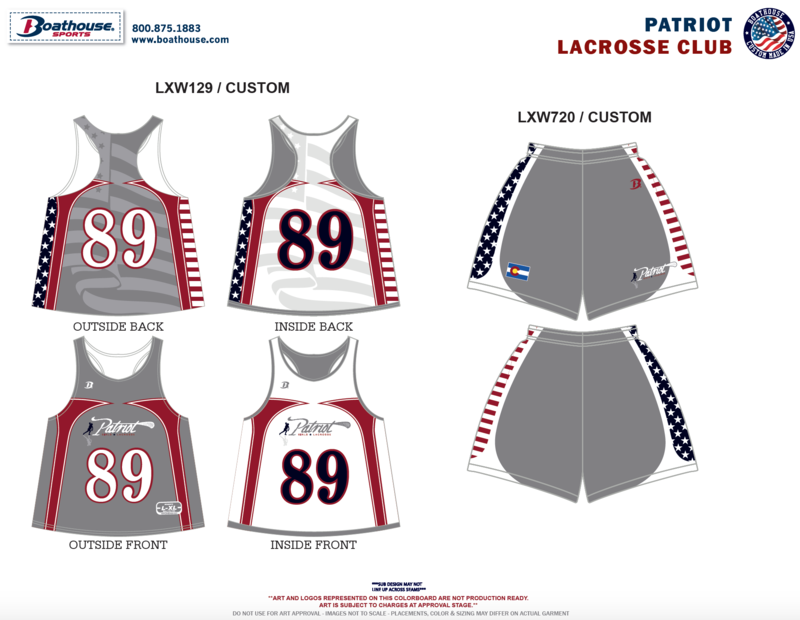 If you are new to Patriot Lacrosse you must purchase a complete uniform. Pinnies are separate and can be ordered. If you are a returning player from 2018 spring season you do not need to purchase a uniform unless you player needs a large size. Each item maybe purchased separately. We will NOT be handing uniforms out during the parents meeting, instead we will schedule a time at a later date. Note: Patriot Lacrosse reserves the right to change the uniform for future seasons. • Coaches: All coaches are required to have a current US Lacrosse membership, an annual background check, and must complete concussion training. Head Coaches are required to complete US Lacrosse Level 1 coaching training. • Team equipment: goals, balls, goalie gear, field supplies, etc. NOTE: The only way to pay for registration & uniforms is via PayPal. Patriot Parent Information night will be on Tuesday, February 12th at 7:00 PM in the Cafeteria at Pine Creek High School.